What’s particularly pleasing about Leeds is that you don’t have to haul your arse too far from the station when on the hunt for nourishment. We enjoy an amble around the top end as much as the next liver-pickler, but there are times when one simply can’t be bov’d. And so it was that after a couple of Friends of Ham liveners we padded down the road seeking out some quality sustenance. Unfortunately Mill Hill Kebabs was closed, so we went to Bundobust. Lovechild of The Sparrow and Prashad. Near t’station. 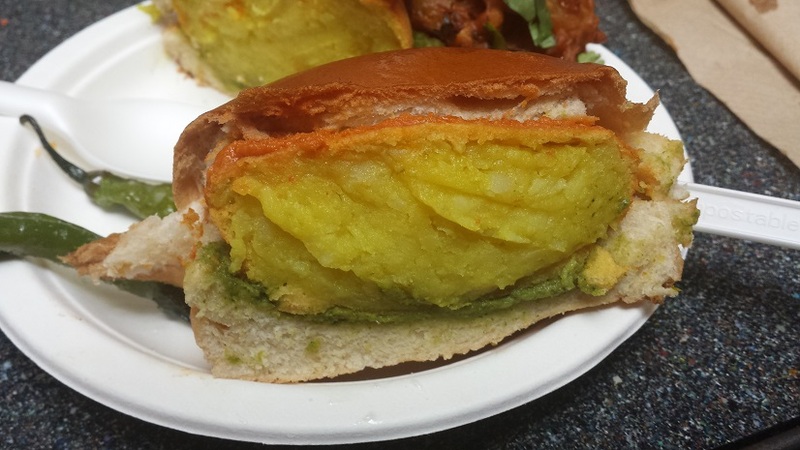 Indian Street Food. Proper beer. Doors on walls. Outside-inside smoking bit. Meat free, thus healthy. Bundobust isn’t a restaurant – folk flock here as much for the specialist beers as they do the food – but describing the fodder as ‘bar snacks’ doesn’t really cut it; this stuff’s more interesting. 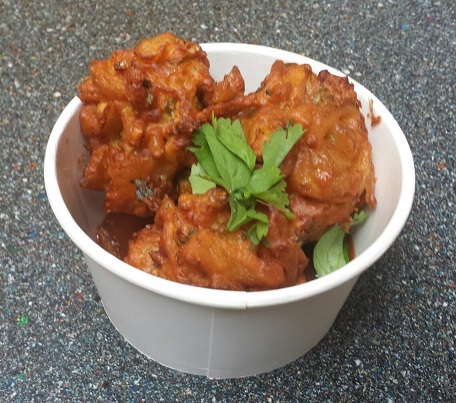 Take the Bhaji. As much as those stodgy bullets you get in some (most) curry joints do the necessaries after an evening of imbibing, the offerings here (3 for £4) are very much from the well-heeled side of the family. There’s the sweet, moreish hit of fried onion in a rustly batter but with none of the cloying clagginess you might get elsewhere. A whack of earthy freshness from chopped cauliflower helps it along nicely; dredge the lot through the tangy tamarind sauce for a slick of umami happiness. Stick another one in the pot and we’ll be even happier. 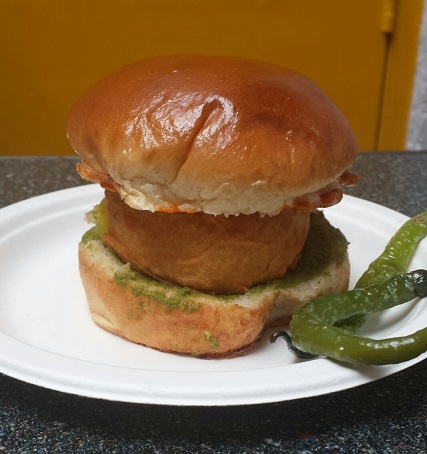 The Vada Pav (£5), in essence a spiced potato cake lightly battered, fried, then slung in a chutney slathered brioche, reminds us that good things will usually come when (seemingly) simple stuff’s done properly, like this. As if soft, piquant, fried mash – IN BREAD – could be anything but a winner. And anywhere that bothers to salt a couple of chillies, elevating them from garnishy nothingness to punchy, hangover-blasting beer snackage gets a gold star from us. The substantial ‘mini rice crepe’ in the Massala Dosa (£6) aren’t that mini. You get two, as crisp as a dry-hopped Citra IPA, (of which there are probably several limited edition, small batch offerings at the bar) filled with more of that warming potato and onion ‘dry fry’. The lentil soup they accompany had far more spike and spark than the virtuous name might suggest, possibly from that chilli still echoing round the gob, but more likely from the coconut chutney – nutty, not sweet – livening things up. We didn’t have the Chaat this time, but that was us being stupid. It has crunch and zip and you should get amongst. None of this is blow-yer-balls-off hot by the way, but chilli-chasers won’t have to scour the concise menu too hard to get a smart slap of heat. Bang on beers and tip top, exciting scran. Well worth the two minute yomp from the station. Well worth a visit, in my opinion. Let us know how you get on if/when you go.